Representative Lindy Boggs. She seemed to appear everywhere we searched. We found her speaking in the halls of Congress urging the restoration of the old burial ground, at board meetings of the Association for the Preservation of Historic Congressional Cemetery counseling patience and staying the course, and in newspaper accounts of House committee meetings where she pressed colleagues to provide funding for saving the federal monuments at the cemetery. How did this remarkable woman, who recently passed away at her home in Chevy Chase, become the central figure in Congress leading the effort to preserve this historic burial ground? This story of perseverance and dedication began with a tragedy, the 1972 disappearance of her husband Representative Hale Boggs on a plane trip in Alaska. Until that event, Lindy Boggs was his most ardent and faithful supporter, campaign manager, and political advisor. Though grief-stricken, she responded to this great loss by entering the special election held to fill the remainder of his term. She won that election and stood again for a full term the next year. Over the coming years, until 1991, Lindy Boggs remained in the House representing the 2nd District of Louisiana. During a distinguished career with many memorable achievements, she served on the Banking and Currency Committee and the Appropriations Committee during 18 years in the House. It was the latter assignment, however, that provided an opportunity to help restore Congressional Cemetery, originally founded in 1807 and located 1.5 miles southeast of the Capitol. By the early 1970s, the site was in disrepair and badly in need of assistance. Membership on the Appropriations Committee allowed Lindy Boggs, along with fellow House member Tip O’Neil and Senators Mike Mansfield and Hugh Scott, among many others, to provide the leadership that passed Public Law 94-495 authorizing the Architect of the Capitol to oversee the restoration of federal monuments at the site. Signed by President Gerald Ford on October 14, 1976, the law granted the old burial ground federal recognition as an important historical landmark. Over the next five years, Boggs led the movement to provide funding for the law, eventually succeeding in 1981. That same year, Congress voted to establish a Congressional Cenotaph at the cemetery honoring her husband, a fitting tribute to both the husband, who had died in the midst of public service, and his wife for helping fulfill his legacy and her own as members of Congress. The preservation of Congressional Cemetery has been, of course, the result of efforts by a large number of individuals and organizations who banded together, over the last 40 years, to bring about its present revival. Without the strong voice and actions of Lindy Boggs during the critical years of 1976-81, however, when the movement to save the site was just getting underway, that development might have faltered. Those who love the cemetery was always be indebted to Lindy Boggs for an effort that has led, over time, to the restoration of a site that remains America’s first national burial ground, a place where “the memory of the nation” is alive and well. Note: Both the focus and historical sources for this blog can be found in Abby Arthur Johnson and Ronald Maberry Johnson, In the Shadow of the United States Capitol: Congressional Cemetery and the Memory of the Nation (New Academia Publishing, 2012). As the federal government oversaw the process of developing the new capital city in the District of Columbia, an unanticipated need emerged that called into question Peter Charles L’Enfant’s 1791 plan for Washington. Over time there would be many questions raised about the plan but this one called for a more immediate answer. The L’Enfant plan had not provided for a cemetery. There were existing burial sites both within and on the border of the new city, such as Holmead’s Cemetery and Rock Creek Parish Burial Ground, but for Congress both sites were a challenge to reach over the existing, still undeveloped road system of the District. 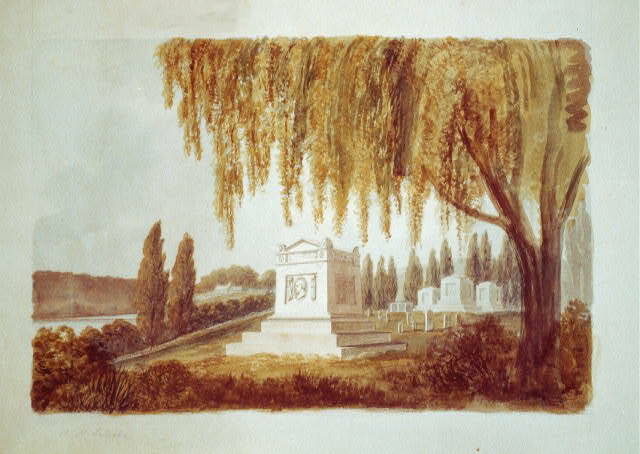 In 1802, Congress authorized enhanced maintenance of Holmead’s as the Western Burial Ground and a new Eastern Burial Ground, but the difficulty remained of how to integrate these locations into a state funeral that involved a formal procession to the burial site over a long distance on rough roadways. An example of that challenge occurred on February 6, 1807 when Congress buried Representative Levi Casey of South Carolina, a veteran of the Revolutionary War, who had died in office three days earlier. In his case, the House chose to bury the deceased Congressman in the burial ground of Georgetown Presbyterian Church, situated on the western edge of the city. As described in The National Intelligencer, after the funeral, the remains were escorted down Pennsylvania Avenue–still a rugged, unpaved, dirt road–past the White House by a Marine Corps military unit, chaplains of Congress, ministers, physicians, six generals as pallbearers, members of the House and Senate, officers of the federal government, and members of the general public. The procession had to stop at Rock Creek due to a lack of an adequate bridge and the participants, stepping down from their carriages, crossed the creek on foot and proceeded to the church burial ground for the final graveside ceremony. With even the main roads filled with potholes and barely cleared of thickets and brambles (“as much a wilderness as Kentucky” according to one source), Congress would need a burial ground closer to the Capitol, one that would allow state funerals and burials to take place in less time and more easily accessed than encountered with the burial of Representative Casey. Within weeks of the Casey state funeral, an answer emerged with the founding of a new eastern burial ground. This one, considerably closer to the Capitol than any other in the area, was established on April 4 by a group of locally prominent citizens who acquired Square 1115 of the L’Enfant plan to be used as a municipal burial ground. Four days later, the new cemetery had its first burial, William Swinton, an expert stone cutter hired by Benjamin Latrobe to work on the Capitol. Two weeks later, the second burial occurred when Margaret Tingey, wife of Commandant Thomas Tingey, head of the Washington Navy Yard, passed away after a long illness. Then, on July 22, the new burial ground was used by Congress for the burial of Senator Uriah Tracy, the first of a long series of members of the House, Senate, and executive branch who would be interred there. For the next nearly sixty years, the burial ground founded on Square 1115–eventually transferred to the care and ownership of Christ Episcopal Church on G Street, S.E. and, after 1820, known popularly as Congressional Cemetery–would become the first national burial ground in the United States. Never officially incorporated as a federal governmental site, the cemetery nevertheless functioned in that capacity. In 1817, Congress authorized Architect of the Capitol Benjamin Latrobe to design a federal monument to be placed over the graves of all members of Congress buried there and, in the coming decades, the Congressional cenotaphs became the only federal memorials of their kind. Earlier, the deaths of Vice Presidents George Clinton in 1812 and Elbridge Gerry in 1814 laid the basis for what would be recognized as the most elaborate burial processions in the history of the federal government, climaxing in the 1841 temporary burial of President William Henry Harrison and followed by the 1848 and 1850 temporary burials of John Quincy Adams and Zachary Taylor at the site. 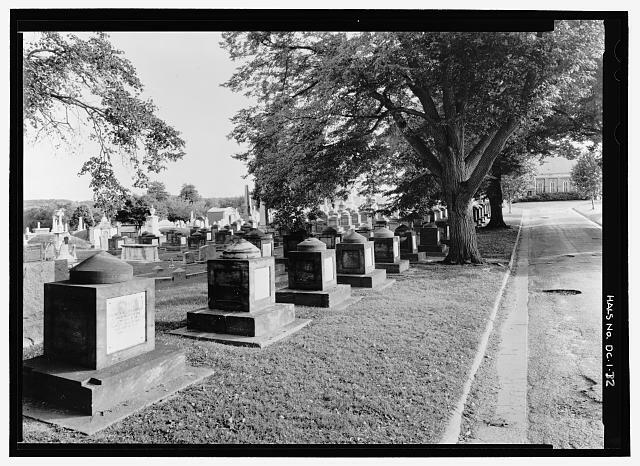 The role of Congressional Cemetery as the national burial ground came to an end with the Civil War and the post-war rise of Arlington National Cemetery. 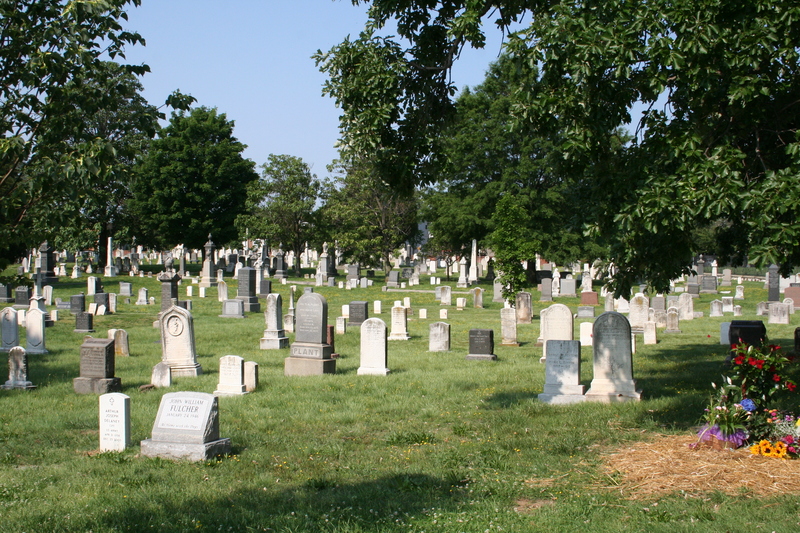 After a century of physical decline and near abandonment in the early 1970s, Congressional Cemetery was rescued by a combination of private and public efforts. The former came about under the leadership of the Association for the Preservation of Historic Congressional Cemetery while the latter was a result of members of Congress, particularly Representative Lindy Boggs, in bringing about federal funding for preserving the Congressional cenotaphs and general maintenance of the grounds. A key event in this effort was the 1981 placement of the most recent cenotaph in honor of Representatives Hale Boggs and Nick Begich, both who died in an airplane crash in 1972. Inspired by that event, members of Congress in both the House and the Senate worked throughout the 1990s and first decade of the twenty-first century to create a matching fund mechanism that today provides funding for the preservation and upkeep of the site. The antebellum role of Congressional Cemetery has long been over but today the old burial ground is the focus of national memory and a place of increased public attention and support. Both the focus and historical sources for this blog can be found in Abby Arthur Johnson and Ronald Maberry Johnson, In the Shadow of the United States Capitol: Congressional Cemetery and the Memory of the Nation (New Academia Publishing, 2012). 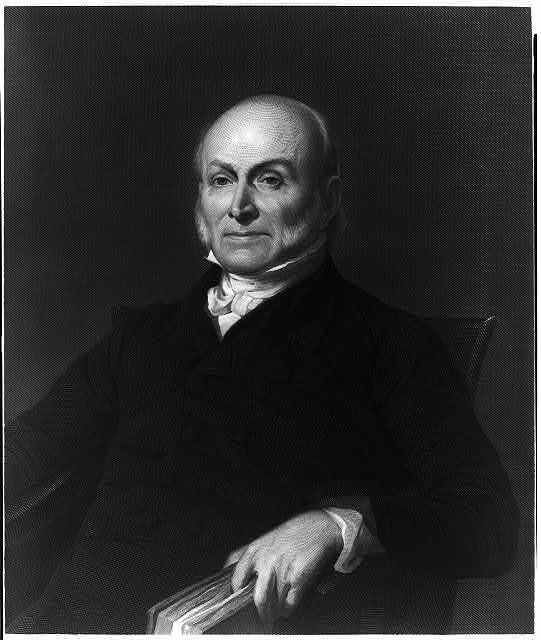 The death of John Quincy Adams occurred just as the first telegraph links between major Eastern cities had been established. Word of his collapse on the floor of the House of Representatives, and his death two days later, spread rapidly throughout this section of the nation and along the first lines just opened to the west. The new technology helped produce, as Harlow Giles Unger observed, “a universal outpouring of grief” and broadened the immediate sense of mourning Americans felt over a loss of a great national figure. Fittingly, a former President who had always sponsored the scientific advance of knowledge was now honored in death through the use of an invention that dramatically had expanded public awareness of events as they occurred throughout the nation. The state funeral staged in memory of Adams and then the procession to Congressional Cemetery took place on 26 February 1848. The events of that day were both “solemn” and “imposing,” as recalled by William Henry Seward, later a U.S. senator from New York and biographer of Adams. The parade to the graveyard, which commenced upon conclusion of the midday service in the House of Representatives, had special resonance given Adams’ prior visits to the cemetery. During his long years of service in the U.S. government, he had participated in many processions to Congressional Cemetery. It was appropriate that he was remembered in an elaborate parade to the same site, even if it was only to be a temporary stay. The procession had many remarkable features, complete with military units, members of the House and Senate, President Polk and his cabinet, the Supreme Court, representatives of civil organizations, and the general public. At the center of the procession was the catafalque with the body of Adams, accompanied by twelve pallbearers. Perhaps the most intriguing pair of pallbearers was John Calhoun and Thomas Benton. Calhoun, a slave owner, had long been on the opposite aisle in Congress from Adams, but the two had remained friends. Calhoun must have had complicated emotions as he accompanied the body of John Adams to the graveyard. As for Thomas Benton, a moderate on the issue of slavery, opposing both its abolition or extension, he had stressed preserving the union among states. Like Calhoun, he was a long-time political opponent of the deceased. He had agreed, however, to deliver a speech seconding a motion in the Senate to honor Adams but later recalled his personal struggle in praising a politician he had so consistently opposed. 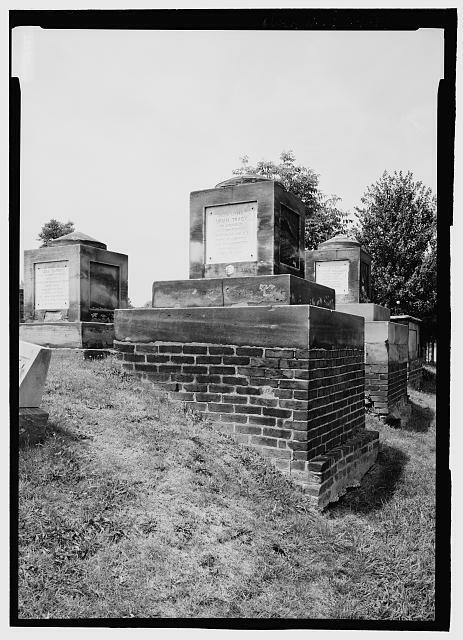 Upon reaching Congressional Cemetery, the body of John Quincy Adams was placed in the Public Vault, where it stayed for approximately one week. On 5 March 1848, the Adams family and a select group of Congressmen oversaw the delivery of Adams’ remains to the train station located on the mall just west of the Capitol, and then accompanied the body of the former president on a five-day, five-hundred-mile journey to Quincy for burial there. The train stopped at both large and small towns along the way, where waiting crowds paid their final respects. In the countryside, the cortege passed through long lines of people standing silently with bowed heads. The state funeral of John Quincy Adams was staged by Congress as part of an evolving tradition that stretched back to the death George Washington. The first U.S. President had been buried on the grounds of Mt. Vernon after a private funeral conducted according to Masonic rites. The format of private funerals for his successors continued through the 1830s. Earlier, however, in 1812 and 1814, Congress had held state funerals and processions for Vice Presidents George Clinton and Elbridge Gerry. Those two ceremonies created a model that would be in place in 1841 for the funeral and burial of William Henry Harrison and, seven years later, Adams. In 1850, Congress held a similar state funeral and burial for Zachary Taylor. Thus, fifteen years before the greatest of all presidential funerals following the assassination of Abraham Lincoln, Congress had established a tradition of state funerals and processions that remains in place today. 2. For more details of the Adams funeral and procession see Lynn Hudson Parsons, “The ‘Splendid Pageant’: Observations on the Death of John Quincy Adams,” The New England Quarterly 53 (December 1980), 464-482. 3. The history of U. S. presidential funeral processions is most recently studied in Abby Arthur Johnson and Ronald Maberry Johnson, In the Shadow of the United States Capitol: Congressional Cemetery and the Memory of the Nation (New Academia Publishing, 2012), 80-94. Congressional Cemetery’s website includes a page with collected newspaper accounts of Adams’ stroke, death, and funeral procession.